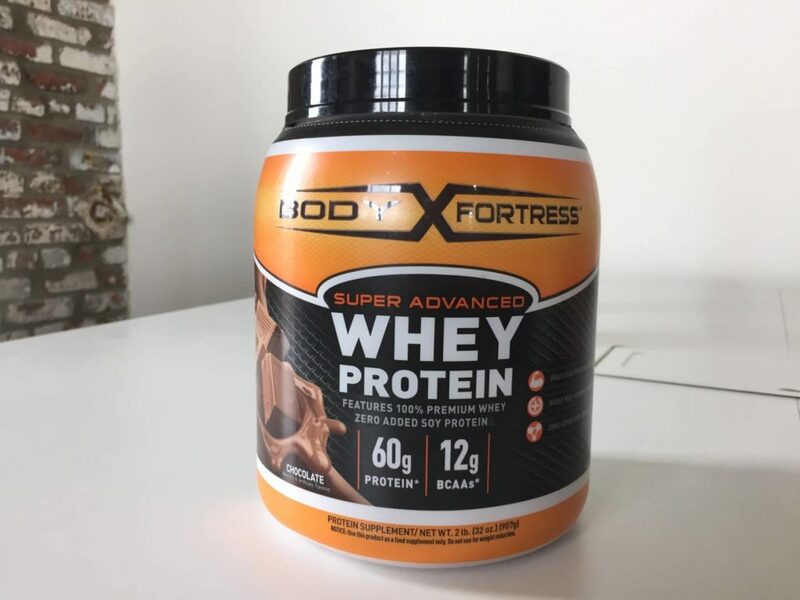 Home » Body Fortress Super Advanced Whey Protein Review – The Right Labeling? Body Fortress is manufactured in upstate New York, and they sell a variety of inexpensive workout supplements like amino acids, fat burners, and nitrous oxide supplements. They also produce four kinds of protein powder. I wanted to check out their “Super Advanced Whey Protein, a relatively high-calorie blend that also comes with creatine, taurine, and extra glutamine. At fifty grams, these are pretty big scoops and they provide 200 calories each: 30 grams of protein, 8 grams of carbohydrates (1 gram of fiber) and 5 grams of fat (2.5 of which are saturated). There’s also a remarkably large amount of cholesterol, 42 percent of your recommended daily intake. With 110 milligrams of sodium per scoop (5 percent of your daily intake), it’s slightly saltier than your average protein as well. The protein is packed with 60 grams of protein per 2 scoops, along with 12 grams of BCAAs. Besides that, there’s a decent amount of calcium, magnesium, and potassium as well (13 percent, 8 percent, and 7 percent respectively). The “super whey protein blend” is the first ingredient, and it’s a combination of whey concentrate and isolate. That means there’s more concentrate, which has more fat and carbs, than isolate, which is lower calorie and more expensive. Then there’s maltodextrin, a sweetener usually made from wheat and corn; cocoa; natural and artificial flavors; soy lecithin, which improves mixability; cellulose gum as a thickener and stabilizer; and the artificial sweeteners acesulfame potassium and sucralose, also called Splenda. There’s also a “super recovery blend” of 1.5 grams each creatine, taurine, and l-glutamine. 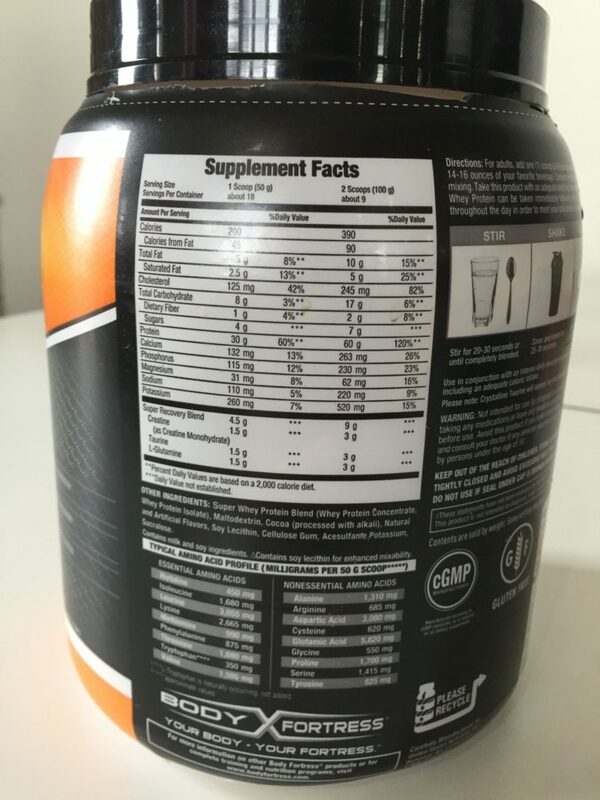 About that “super recovery blend”: 1.5 grams is not much creatine (5 grams is the standard dose) and glutamine is likely a pretty useless supplement. It’s a decent dose of taurine, which might improve blood flow and exercise capacity, but the whole blend seems pretty token. Is the protein effective? 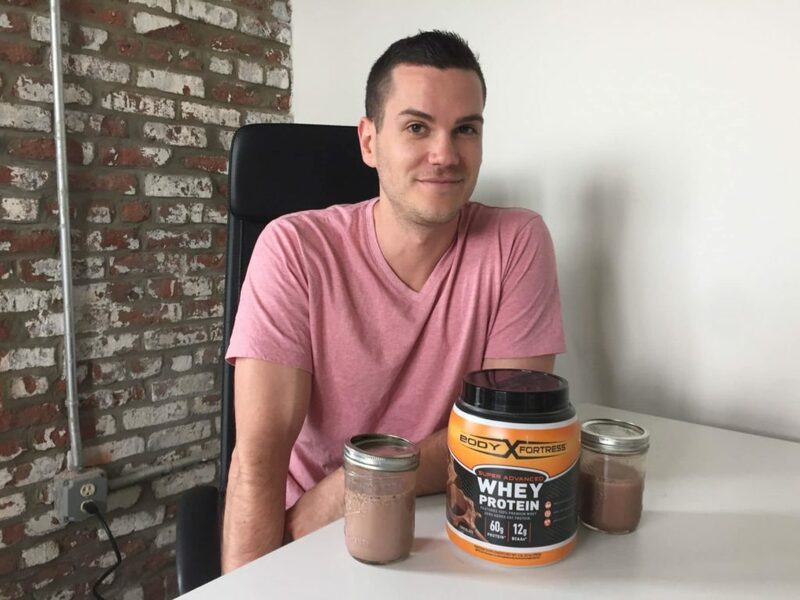 Well, it’s whey, so it contains a full spectrum of amino acids, but it doesn’t contain any digestive enzymes, so if you’re sensitive to lactose or you have trouble digesting powdered protein, this might not work out for you. It also contains soy and acesulfame potassium, two ingredients that, while generally considered safe, are controversial in some circles ad may put off some consumers. 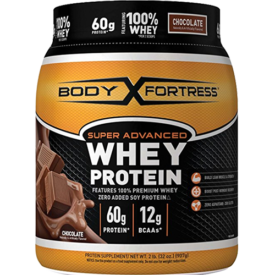 Finally, I’d be remiss if I didn’t mention that Body Fortress Super Advanced Whey Protein doesn’t have the best reputation among all third party testers. For example, when Labdoor conducted an assessment, they found that it had less than two thirds (62 percent) of the protein advertised. You can buy 2 pounds of the stuff for about 30 dollars on Amazon, which is $1.66 per serving or 5.5 cents per gram of protein. “Per gram of protein” is the best way to compare the price to other brands since the serving size of Body Fortress is so big. When looking at this metric, it’s very inexpensive, about the same price as Optimum Nutrition Gold Standard Whey or Cellucor Cor Performance Whey and a little more expensive than MusclePharm Combat Whey and MuscleTech Pro Series Gold Whey. It didn’t mix well. Little clumped together chunks of protein powder bounce around the shaker, sticking to my mouth and making for a somewhat unpleasant experience. It’s not often that a flavor can be both cocoa-like, which is itself a bold, earthy taste, and mild. Somehow, that’s what Body Fortress is: it’s a dark chocolate flavor that’s both watered down and persistent, hanging around the mouth long after the first sip. It’s not so bad that you’ll have a profound reaction to it, but it’s not enjoyable, and mixed with water it tastes like, well, water. Mild, but bad. It’s almost an impressive feat. I found a few issues with Body Fortress’ Super Advanced Whey Protein. For example, I thought taste was subpar. It’s cheap, sure, but I wouldn’t pick this over a competitor like Optimum Nutrition Gold Standard Whey or Cellucor Cor Performance Whey.